The white oak is said to be the most useful tree in North America. This eastern species is known for the strong wood and silvery-gray (“white”) bark of its straight trunks. But its usefulness goes much further. A park ranger giving a tour of Huntley Meadows Park once pointed out that the “damaged” leaves of fall are in fact just a demonstration of the full cycle of life. Those leaves have served their purpose, and served it well, he said, providing food and shelter to insects and other small species that attach their pupae, lay their eggs in galls, or otherwise use their material. 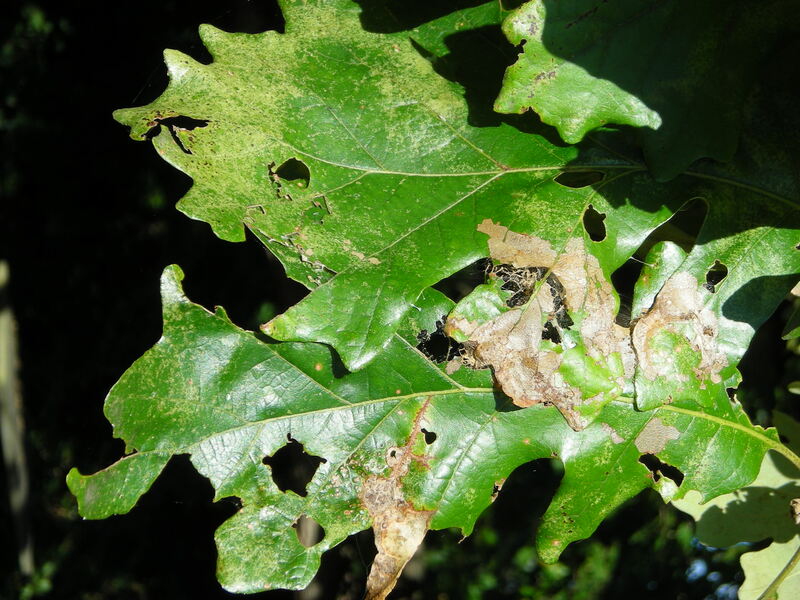 Naturalist Douglas Tallamy wrote in his book Bringing Nature Home that the white oak supports up to 534 species of lepidoptera, not to mention beetles, spiders, wasps, and other insects that use portions of the tree for food or shelter. Squirrels, black snakes, gray tree frogs, woodpeckers, jays and other sorts of birds and animals make their home in the oaks. The acorns provide food to many animals. The photos included here reveal the ways in which even the leaves, at this autumn season, have been well used and fulfilled their purpose. Not only did they make food for the tree, they provided food for other creatures. 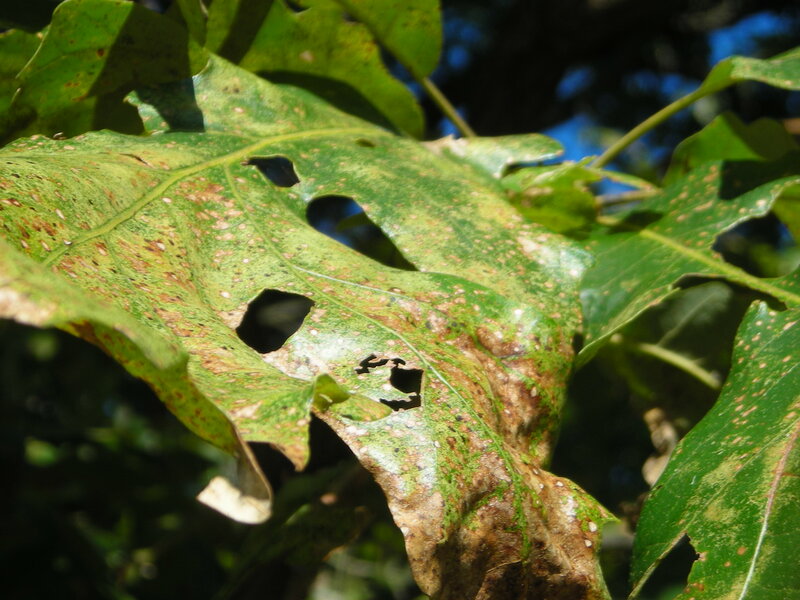 We need not always think that leaf damage is a bad thing. As long as they don’t denude the whole tree, the creatures that nibble on our plant leaves are also part of the greater cycles of life in nature. This entry was posted in MG in the Garden and tagged beetles, Bringing Nature Home, Douglas Tallamy, lepidoptera, spiders, wasps, white oak. Bookmark the permalink.